Devereaux Sinclair from Denise Swanson's Little Shop of Homicide. Hi! Sorry I can’t stick around today and chat for very long, but I allowed someone to write a book about me. It came out Tuesday, and Devereaux’s Dime Store and Gift Baskets has been a mad house ever since. Don’t get me wrong, I’m thrilled about all the customers, but I’m just so busy. If it weren’t for some of the stuff in my history—my dad being in jail, my previous boss running a Ponzi scheme, and my ex-boyfriend’s fiancée getting murdered—I’d be happier. My best friend Boone St. Onge warned me, but I didn’t listen to him. He might be a small-town lawyer who normally handles mostly divorces, wills, and real estate deals, but he’s one smart cookie, so I should have known. Anyway, since that darn book came out, things in Shadow Bend, Missouri have been crazy. My grandmother, Birdie Sinclair, thinks the whole thing is a hoot. Although, she isn’t too happy that the author claims that Gran has memory issues. Birdie says that at her age, anyone who doesn’t forget something once in a while is the strange one. And when I complain to my other BFF, Poppy Kincaid, she just laughs and says whatever increases sales is a good thing. And I guess she should know since she owns Gossip Central, the hottest club within an hour of Kansas City. At least Jake understands. He’s this hot U.S. Marshal who’s on medical leave. He volunteered to help me investigate the murder I was accused of committing. Although, I think the real reason he’s so ticked off about the book is that it sort of blows his ability to work undercover. Hmmm! In that case, maybe, it was a good idea to let Ms. Swanson write the book. Because if Jake can’t work undercover, maybe, even if his leg heals, he’ll stick around Shadow Bend instead of going back to St. Louis. So, would you like a book written about your? 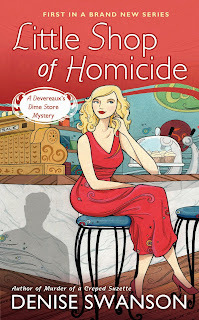 --Little Shop of Homicide, the first in the Devereaux’s Dime Store mysteries by New York Times bestselling author Denise Swanson debuted March 6, 2012. I wouldn't like being a character in a book. Sounds spooky. How could I be? I'm a real person making quilts, teaching quilting, and selling all the supplies. Um...do you think I should tell Naomi that she's not real and that we're all characters in books? What? Wash your mouth out, Willow! We're just like other folks, enjoying friends and family, making a living, catching bad guys. What's not real about that? Not real? Hah! Some characters get the weirdest ideas. I will admit, though, that it is a little bit unnerving to be written about. Kind of like living our lives on a reality TV show. Everyone knows all our secrets. Too bad about Jake. Undercover is tough in book land. Of course, we're real. Maybe it's the writers who are fictional. I'd hate to have a book written about me! Unless it was a romance, with a yummy hero... LOL. But then, I don't think anything exciting enough for a book has ever happened to me, or Queensville, Michigan! All the characters in the books I read are sure real to me! That's what your author works so hard at, making you real! I would love to have a book written about me, you are a lucky girl Devereaux.